Navigating throught Suzuki Super-Bikes II: Riding Challenge's menu is designed for simplicity. "Multiplayer" is on the menu and "Single-Card Game" follows immediately after. The opening credit sequence is a little long and can't be skipped. The download time is average, but it's split into several smaller parts. For some odd reason, tapping on the menu options doesn't do anything -- you have to tap on the icons to the left of the menu options. Other than that, the icons themselves are clearly defined and separated and the menu option labels are easy to read and well-worded. Suzuki Super-Bikes II: Riding Challenge is actually a little easier to pick up and play than most car racing titles, and is the easiest "serious" racer to pick up and play of all those so far reviewed on this site. Part of this is due to simpler motorcycle mechanics: there's no drift in motorcycle racing. Another part of this is due to not always having to break to take a turn, though there still is a balance to maintain. Another part has to do with successful and simpler programming. There are no touch controls, but touch controls aren't needed and would likely be less efficient than the button controls that are included. Feature-wise, there are two different courses to race on. Audibly, the host and the guests receive two entirely different experiences: the host is treated to music that masks the sounds of the bike, while the guests hear only the sounds of the bike. Graphically, the game is also a mixed bag. The backgrounds, even in just the two courses provided for the Single-Card Download racing experience, and distinct and detailed, BUT... they're pixelated. The wipeouts look great (don't wipeout), but the racers are one with the bike (literally) and don't move... at all... any part of them... in any way. Also, in between the races, the on-screen "Exit" button can't be tapped; the "A" button must be pressed instead. I've reviewed a lot of racing games lately and I haven't been particularly impressed by most of them. While I knew Suzuki Super-Bikes II: Riding Challenge (SSB2) was different (being motorcycles instead of cars), I honestly didn't expect much. I began playing and I was all over the place, wiping out and falling far behind. I came back quickly, however, and picked up some subtle differences in the physics engine - differences that actually make sense. As an example, while most driving games make use of drifting while turning, SSB2 doesn't - mainly because drifting on a bike would be really bad. Instead, the game makes good use out of balancing accelerating vs breaking vs coasting (neither accelerating nor breaking). The physics differences result in a game that is much easier to get good at more quickly. This is fantastic for starting and younger players, but in the main game (which is not reviewed here), this COULD lead to a less challenging game for some players. One thing that sets a bad example for guests is the fact that guests get a different racing experience than the host - guests hear only sound effects while the host hears only music (the sound effects are there, but are effectively drowned out). There's also a quirk where you can't tap the on-screen "Exit" button after a race: you can only get past it by pressing the "A" button. 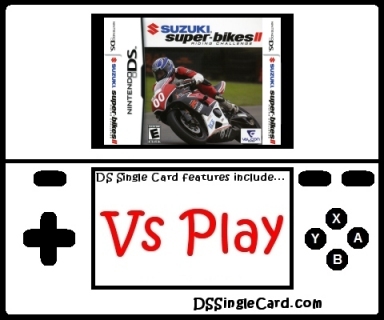 Suzuki Super-Bikes II: Riding Challenge is not the best racer in the world, and it's not even the best racer on the Nintendo DS with Single-Card Download multiplayer, but it is a fun racing game to have when in the mood for a quick, mindless race with nothing on the line. It's been down at a budget price for a while now (sometimes selling for as low as $10, making it a great deal). I would also recommend it as a good introduction to racing "simulators" for players who've never played racing games, or for players who've never played a racing game outside of the "kart" genre. Shorten up the opening credit sequence and/or make the majority (all?) of it skippable. Allow players to tap on menu options, not just the icon(s) next to the menu options. Provide an option for the host to turn off music and experience the same race (audibly). Animate the bikers (at least part of them) throughout the race. Repair the on-screen "Exit" button in between races.